PMC offers reliable, accurate range ammo at low prices. 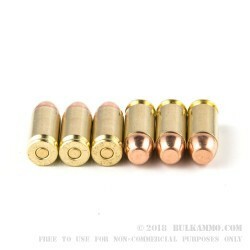 This .40 S&W load uses a 180 grain bullet and achieves muzzle velocities of about 985 feet per second, only slightly slower than the 165 grain load. 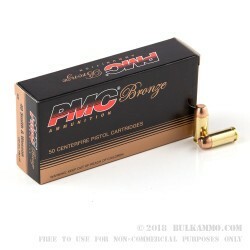 Like all PMC Bronze ammo, it uses reloadable Boxer-primed brass cases. 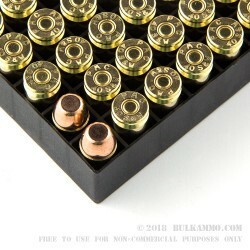 Each box holds 50 rounds. PMC ammo has achieved widespread popularity in the US thanks to its low price, reliable feeding, and consistent ignition. PMC rounds are manufactured by the Poongsan Corporation in South Korea and subjected to rigorous quality control inspections. 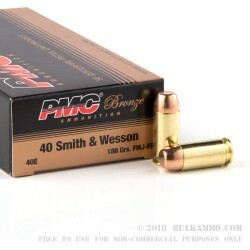 The widespread availability of PMC ammo comes thanks to the company's high production capacity, which serves South Korean military customers as well as American shooters. Glad I got the bulk 1000 didnt see them on the web page. awesome rounds to go out and shoot on the range without breaking the bank. cant wait to order more, and as always super fast delivery.